The Natalia Mustangs started off 30-3A on the right foot last week, with a road victory at Dilley. The Mustangs were able to out-hit the Grey Wolves 7-5 en route to a 3-0 shut-out road win in Frio County. “I was pleased with our effort and overall execution,” stated Coach Jeff Terry. 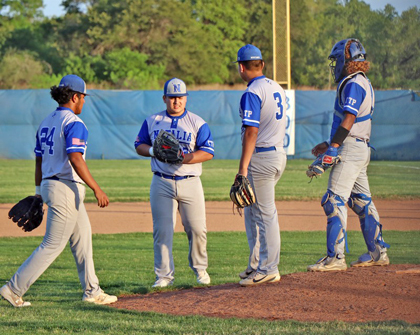 Natalia Mustang Jeremiah Castro went the distance for the boys in blue, as he pitched 7.0 innings versus the Wolves. He allowed five hits, struck out seven, walked 0 and gave up 0 runs during the road game. After watching three scoreless innings go by, the Mustangs got things going in the top of the 4th. After watching a ground-out, Natalia’s Manuel Garcia got a single up the middle. After stealing 2nd base, he scored thanks to a single by Uriel Arellano to take the 1-0 lead. Natalia scored their final two runs in the top of the 6th inning. This came with two outs, as Arellano got on base after being hit by a pitch. Diego Zapata singled to score Arellano and Zapata showed off his speed, using Dilley miscues to get around the bases to give the Stangs a 3-0 lead. The boys in blue were able to make a total of 21 defensive plays to shut-down the Wolves with the 3-0 victory. At bat: Zapata 1-3-1run scored, Garcia 1-3-1run scored, Castro 1-3, Joel Mendez 0-2, Matt Contreras 0-3, Gavin Martinez 0-3, AJ Felker 1-4, Jake Navarro 0-1, Arellano 1-2-1RBI-1run scored and Jeremiah Gomez 1-2. Defensive Put-Outs: Arellano 8, Zapata 7, Garcia 2, Contreras 1, Martinez 1. Assists: Castro 3, Contreras 3, Gomez 2, Garcia 1.